Sightglass is a glass with special characteristics. By processing, ordinary glass can have properties that either have a significant impact on safety, or as a function of the completion of a particular use or design. Whether it's solid materials, liquids or combustion processes to be inspected, ÅBS has solutions that meet the specific needs and all products are of course manufactured according to approved standards. Post-processing such as drilling, cutting, etching, silk screen printing, sand blasting, facetting, curing (thermal and chemical), grinding, bonding, milling and bending are done by order of customer. 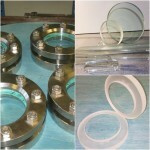 Special glass according to drawing, Sunglass gaskets, Sunglass lighting. Can withstand up to 240 ° C and 35 bar without mica lamella. With mica lamella the glass can withstand up to 280 ° C and 100 bar pressure.